If you are looking for adventure over the Winter months, choosing what to do may actually be the easy part! 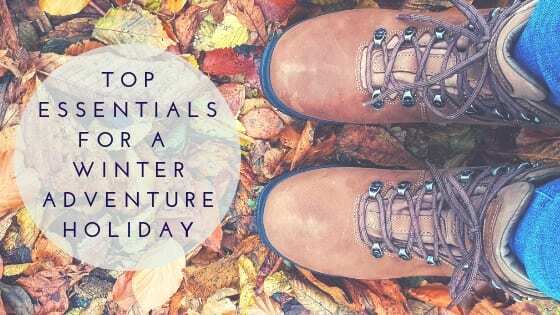 Whether it be, dare I say it, jetting off to even colder climes, or even heading off on a walking holiday, what you pack to take with you is the most important aspect! For a winter adventure holiday, you do not want to be packing heavy items especially if you will be carrying your bags as this will cause extra strain. Instead, let’s have a look at some of the essentials you definitely need to consider packing! Most winter jackets tend to be heavily lined and in some cases even puffy to enable to wearer to keep warm against the chill. Clearly these aren’t ideal for a winter adventure holiday, with the need of something lightweight, that still offers full protection from the elements. Waterproof jackets are an absolute must, with a women’s Berghaus jacket being at the top of my recommendation list. The jackets tick all of the boxes when it comes to being lightweight, fully waterproof, lots of useful pockets, stylish and the jackets even come with a lifetime guarantee! If you intend to walk a fair bit on your winter adventure holiday, then ensuring you have sturdy boots that will last the distance are essential! It’s worth spending decent money on a pair of walking boots that will offer comfort and durability whilst being waterproof and fully breathable. Who knows how many miles you may put on them! I am totally loving how these Brasher boots have revolutionised my dog walks, I only wish I could wear them all the time that are that comfy! It’s not only important to keep a check on the weight of the items you pack, but also the bag you are packing in the first instance! Whilst it’s great to wheel around cabin baggage and put’s less stress on your body, a winter adventure holiday may dictate that you need to travel with a backpack. The Transporter range from Osprey is absolutely fantastic, with different sizes available dependent on your requirements. I absolutely love mine and despite not trekking up any mountains yet, it has already been well used and still looks brand new. It’s so comfortable to carry, that even my 9 year old daughter is happy to walk around with this. Keeping your phone charged is imperative, especially if you will be out and about a lot during your winter adventure holiday, even more so if you are travelling solo. Whilst some phone charging units can be hefty in weight, I’ve found the Varta Slim Power Bank to be lightweight and easy to pack away in the Osprey bag. A full charge of the bank will fully charge a phone five times or a tablet twice. Even if you are not planning on travelling over winter, this is still a really handy item to have around the home! Do you have any plans to take a winter adventure holiday? If so, I hope the items mentioned above have given you inspiration! Disclosure: The products featured in this post have been sent to me throughout the year and fit perfectly into this post. All words and opinions are my own, as always. I love my Varta powerbank. I use it every week! You can’t get better than a lifetime guarantee – it gives you such confidence in the product too. I’ve lost faith in Docs since they removed theirs!